Catherine Faherty has been creating autism teacher training models, workshops, seminars, and speaking at conferences since the 1980’s. Here you will find a sampling of recent speaking engagements, presentations, and professional training from 2017-2019 under “Previous Events”. For newly scheduled presentations, search “Upcoming Events”. 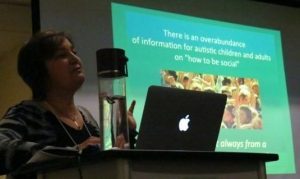 Text from photo on left: There is an overabundance of information for autistic children and adults on “how to be social”…and it’s always from a non-autistic perspective. November 11-13, 2016 in Athens, Greece, Catherine Faherty, TEACCH Certified Advanced Consultant, provides training in the foundational theory and strategies of Structured TEACCHing. For more information or to register, please contact Proseggisi, a Speech and Language clinic, Special Education and training provider based in Athens, Greece. Presentations will be given in English, with simultaneous translation in Greek. Catherine Faherty has been creating autism teacher training models and speaking at conferences since the 1980’s. To inquire about these topics; or to find out if she can speak about another topic, contact: catherine@catherinefaherty.com. © 2017 Catherine Faherty All Rights Reserved.